I’m not sure why this wasn’t named Amazon or something similar. 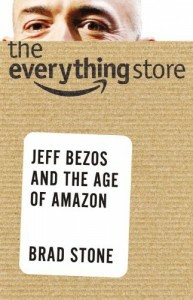 It’s about Jeff Bezos and his rise (and control) of Amazon. Brad Stone made the book quite interesting to read for a typical fantasy guy like myself. However, I’m not sure he showed Bezos in the best of light. Surely every book has a theme or central idea they want to convey right? Well, for this book I guess one of the ideas would be persistence. The idea that if you keep at something, eventually you’ll make your way through. Why do I think this? Because a lot of the time, Stone mentioned that Amazon was losing money. That’s right, Amazon wasn’t a profitable company for a long time. Bezos had the dream of an everything store (hence the title) and so, he persisted against investors and the stock market and came out on top. Another theme could be that it’s hard being at the top. Bezos was portrayed as a man who would strike fear (I don’t think Stone used that word, but I will) in his employees. He wanted them to work for him, not for the perks of the business, but for the challenge. He would scream at some of his employees and would also micromanage parts of the business that he felt weren’t up to his standard. From what I understood, when you were watched by Bezos, that was generally a bad sign. I found that Stone would be on one subject and one year and then go back to the past in the same paragraph. At times, it was a bit hard to follow. However, his writing was fairly conversational and even the technical parts weren’t so bad. For all those who want to study the ruthless and forward-thinking leader (as he is so portrayed), this book would be a nice read. I believe Stone interviewed ex-employees and people close to Bezos to get the entire story as best he could. If you’re not interested in tech, Amazon, etc. then I would suggest you give this book a miss.